I think that other than food I spend most of my money on cosmetics. It can be a right pain and I tend to spend more money than necessary because I am against animal testing and it always tends to be more expensive. I also have horrendously sensitive skin so there are a couple of 'hero' products that others swear by but I can't use because my skin clearly doesn't agree with the chemicals involved. For a mothers day fun event (sadly not with my mum), I was invited by Amba Hotels* to make my own soap and bathbombs - from the beginning this would have been a day full of hilarity and (from my half) epic fail. I was proven right on both counts. Once we had all settled down again, the rest of the fun could begin. And it was more difficult than you would think even though it was a piece of cake IN THEORY. Through a simple combination of liquid soap, vodka (yes, vodka), food colouring and essential oils we started off making a solid bar, I went for vanilla and strawberry and was very proud that I got it right. Next up was a jelly soap. I buy quite a lot of this from Lush and have been using it for years. I was surprised to see just how easy it was was to make and if I made it in bulk then I could probably save a fortune. My first attempt was a bit foamy but I was very happy when it set and I had my own little jelly. The bath bombs... they're an entirely different story. I'm pretty sure most of the people in the room also failed at this. I thought I had succeeded once mine was taken out of the mould and decided to make another one... but then it started to sink and became a lime green pancake. OH WELL! 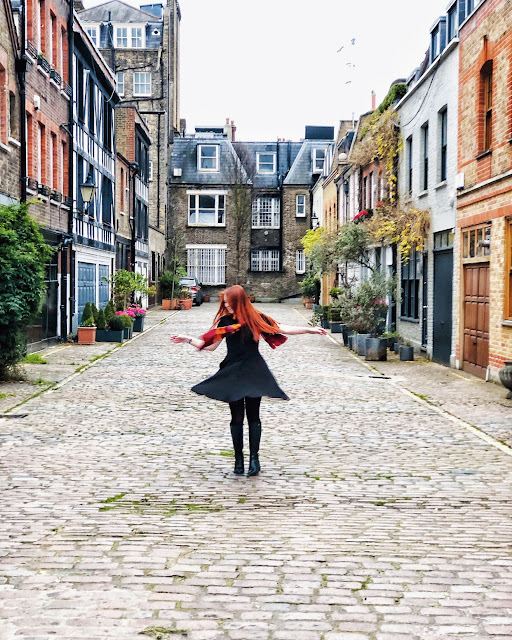 All in all, this was so much fun and I think I'll have to try it all again at home so a massive thank you to the Amba Hotel for inviting me. Have you ever made your own soap? Men's Fashion: Gary let me dress him! So last month I decided to give my boyfriend the challenge of dressing me for a week and it seemed to go down pretty well so we decided to turn the tables and I had a go at being Gok. I have to admit, I thought this would be easy, however dressing boys is a lot harder than you think. Boys don't seem to have nearly as much variety in their wardrobe as girls do, well for my boyfriend anyway, and it's pretty difficult to find something that looks different for each day. This is possibly why Gary tends to just live in t-shirts and jeans. However! Where there's a will there's a way and I'm hoping I managed to pull it off and have one (even slightly) different look for every day. Aww, he's trying to do a blogger pose! The inspiration for this outfit was the one and only Dean Winchester. I absolutely love this jacket (it was once his dad's) and I'm a complete sucker for a checked shirt, they're totally a wardrobe essential for men and women. Gary has this annoying habit of forgetting that other shoes exist. He will usually where the same pair of shoes every day and will then wonder why they fall apart. Just look at these converse stylie things, they're PRISTINE and he's had them the whole time we've been together! He still had work to go to this day so I went for a kinda smart, kinda casual look and he's actually started to go for it more often. Getting used to it now! I love this outfit, I know it's simple but I really enjoyed getting him in Ted Baker and convincing him to buy new shoes. It's not exactly a NEW outfit, as he bought the shoes and jacket for our LFW escapades (on my recommendations obviously) and I bought the bag for him for Christmas. It's strange to see him wearing actual shoes rather than trainers but I still feel pretty proud. This was actually the final day because morning were difficult. I had threatened to put him in a bow tie from the very beginning and there was no way I was going to go back on my word! I actually think he looks rather dashing but maybe that's me being biased. So, who did a better job? Me or Gary? I'm not entirely sure what happened... I'm still trying to work it out. When I was invited to a screening of The Voices earlier this week I intentionally decided to not do any research, I didn't even want to watch the trailer purely because I wanted to be surprised. 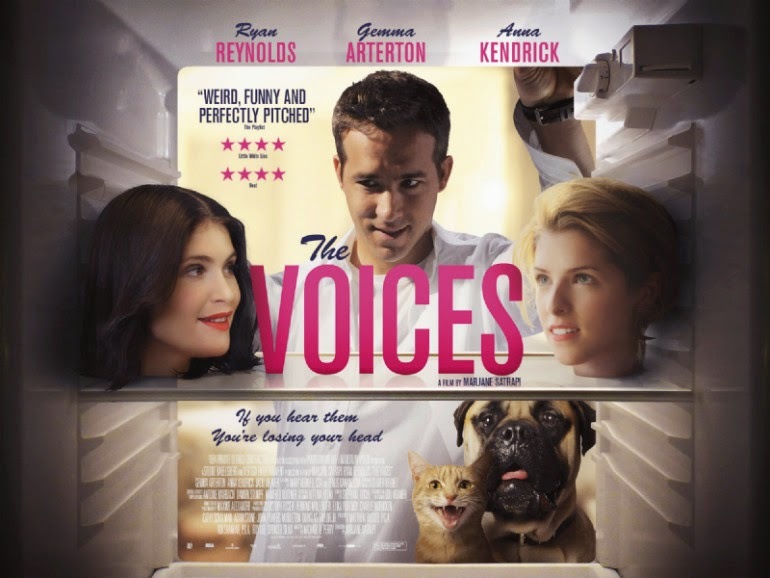 With a title of The Voices and the fact that Anna Kendrick (who I LOVE) was in it, I stupidly assumed it would be some variety of romantic comedy with singing. I was very very wrong. It's more like a black comedy with a hell of a lot of blood and a quite frightening Ryan Reynolds. I haven't seen Ryan Reynolds in a role where he wasn't playing the pretty boy in a romantic comedy so I was shocked and disturbed to see him play some one who, to be honest, was a complete and utter psycho. It didn't seem quite real and the fact he could talk to his pets made it all the more wrong and difficult to comprehend. However, mixing that with the kind of naive innocent elements he brought to the role, I didn't know whether I was scared of him or felt sorry for him. When it came to the comedy side of things, most of it came from the cat Mr Whiskers and his terrible Scottish accent (voiced by Mr Reynolds). His ultra-sadistic wit is definitely my kind of comedy and my delightful boyfriend thinks the only way to describe him is as a C U Next Tuesday. Yeah, I see that. Gemma Arterton's character Fiona annoyed the living hell out of me and it's not the best role for the wonderful Miss Kendrick but over all I thought it was pretty good. I loved this whole, often invisible, line between reality and Jerry's (Ryan Reynolds) own illusions. This is possibly why I got so confused... Is Mr Whiskers real?? Who the Hell even knows?! Did he feed his pets the bodies of his victims? Why is everything so shiny all the time? New glasses have seemed but a dream for a long time now. I have needed glasses since I was about 4 and as a result I have become a bit of a snob and always fall for brand names and beautiful yet expensive frames that are way out of my price range (sorry Tiffany). Annoyingly I have needed a new pair of glasses for about a year as I have a new prescription and my current pair give me headaches. I never thought I'd be able to save money and still get nice glasses if I ordered them online. A friend of mine referred me to SpecsPost a while ago and when I saw the prices I thought I might as well give them ago - no need to make my eyes suffer any longer. There's no excuse. As a person with a tiny head it's always a struggle to find frames that fit me. Pain in the backside really as a lot of the time I have to put up with them being too wide or have to resort to the kids section which is a tad embarrassing when you're 26 (buying kids clothes however is an entirely different scenario). SpecsPost have a petite range though which is a whole new revelation to me. I got to try three pairs at home for free so chose a range of sizes and shapes just to see what suits me best, all them very different to these beautiful Lu Lu Guinness ones I have had for about 4 years now. When I was younger and was going through that kind of 'alternative' stage, rectangle thick frame glasses were very 'in' and I used to wear them all the time so I thought I'd give them another go but trying out different colours. As I'm still a little bit odd I went for pink as I have never had brightly coloured glasses before. A friend of mine says 'The bigger the frames, the better' and ridiculously huge glasses, or 'Hipster Glasses' if you prefer, have never been on my agenda. But why not? They're worth a try! I'm not really sure how to describe these glasses but they're definitely my favourite out of the lot and have had a much better response from my boyfriend than the other two. You can't really tell from the picture, thanks to the poor light in my bedroom, but they're a really deep shade of purple and I love the random detail on the corner of the frames so I think I'll be sending these off for a new prescription! 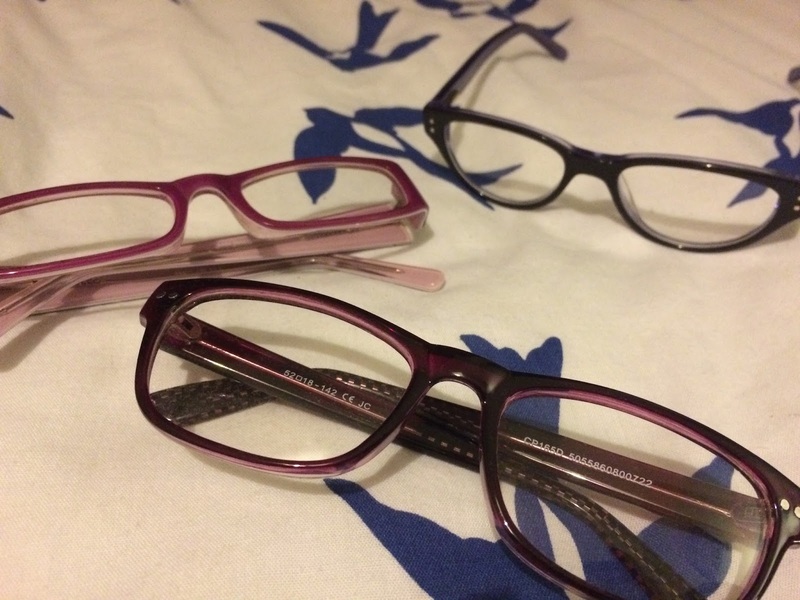 Ordering glasses online is clearly a lot easier than I thought it would be and considering you can get some nice frames for a really good price including prescription, I'll definitely be taking a look for more new ones to make sure I always have a choice. What do you think? Have I made the right choice?